On my Wishlist has always been to decorate a Christmas bedroom and after finding the perfect plaid quilt set to blend well with the paint color in one of our spare bedrooms, I decided to go for it. let’s get to the cozy and festive bedroom I just love. All Buying details a the end of post. 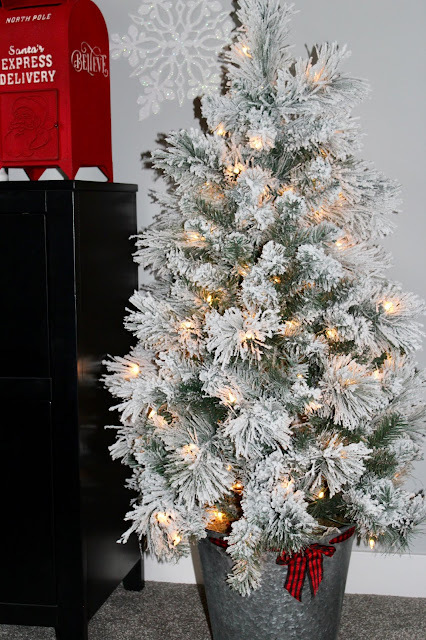 Everything revolved around the bedding and knowing I wanted some white faux fur pillows and a flocked tree in a bucket, lol. After that, the rest of it really came together with lots of fun Reds and Whites. This Quilt set is another amazing find at our local Meijer (grocery superstore). This bedroom suit is from the old house as we opted to keep all our bedroom suits for now but oh how I want new ones in much lighter woods. Funny thing is, everyone says how much they love the guest bedroom furniture, lol (We have 2 sets of this particular set). You may remember the snowflakes on my front porch rocking chairs if you follow me on, They were 2.97 apiece at Wal-Mart and I have not only hung them on the rockers but hung them in windows and now on the walls in here too, Just love them! The Believe sign is from the dollar spot at Target. 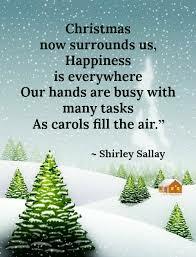 I Wish You the sweetest start to Your Cyber Monday and Christmas Kick-Off week! So festive, Andrea! I have always thought it would be fun to decorate a bedroom for Christmas, too. The plaid quilt is just perfect! Hope you had a wonderful Thanksgiving! This is so fun and cheery. What a gorgeous room. Here I come- get the bed ready haha. Love the tree- can always count on HomeGoods for a beauty! You did such a great job on decorating Andrea! This room is so festive and pretty. 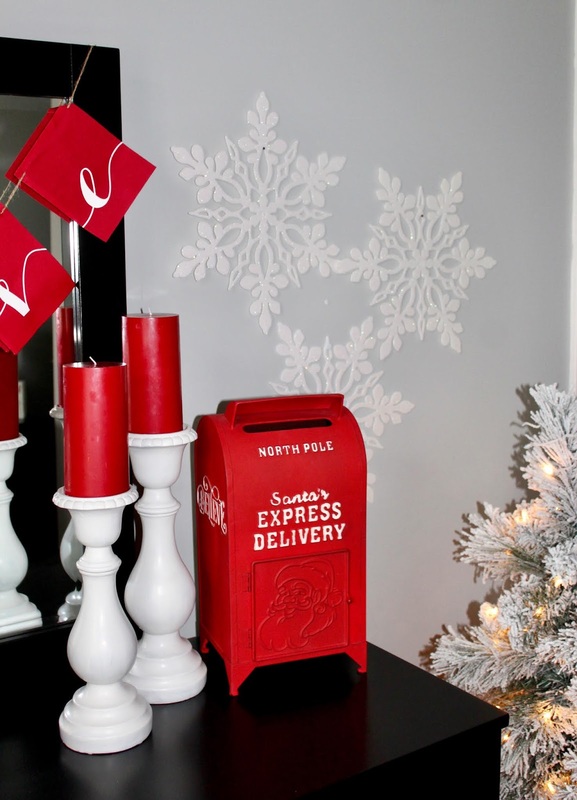 Love all the details especially the tray on the bed and the little North Pole mailbox! Seriously such a cozy space, I wouldn't want to leave. I hope you had a fantastic holiday weekend and happy Monday! That bedroom is everything Christmas dreams are made of! What a fun way to decorate. I love every inch of it and you are the cutest decorator in those precious pjs! Obsessed with this room, Andrea!! It looks like it belongs on the set of a Hallmark Christmas movie -- it's perfect!! Oh my goodness; that is such a beautiful room! I'm not even sure what my favorite part would be... so many wonderful touches. It's perfect. It is beautiful and so festive! I love the layers of color and texture in the bedding and all of your fun finds to bring the room together! So much to love, and I need that flocked tree! Can I come stay and wait for Santa in that room? Dibbs on the room!!! Absolutely LOVE it, Sister, and it turned out far better than I could ever have imagined! I'm still shocked that you found the bedding at a grocery store because you certainly wouldn't find something like that at a grocery store here. Remember? Ours doesn't even sell gnocchi!! Ha! Love you! Merry Monday!! Aw I feel like I would be Christmas cheery every day that I woke up in there! I love the tree from home goods in the bucket! You truly have a gift my friend! I LOVE IT!!! I will usually put a tiny tree and Christmas pillows in my daughters bedroom for when she comes to stay a Christmas. But now I want to do the whole bed cover! Yours is adorable!!! That's it. I'm moving in to your house. Or having you come and decorate mine someday. Either way will be just fine! This room is DARLING - every last detail! A CHRISTMAS BEDROOM? This is genius!!! It looks straight out of a magazine, and I would expect nothing less from my favorite holiday hostess! 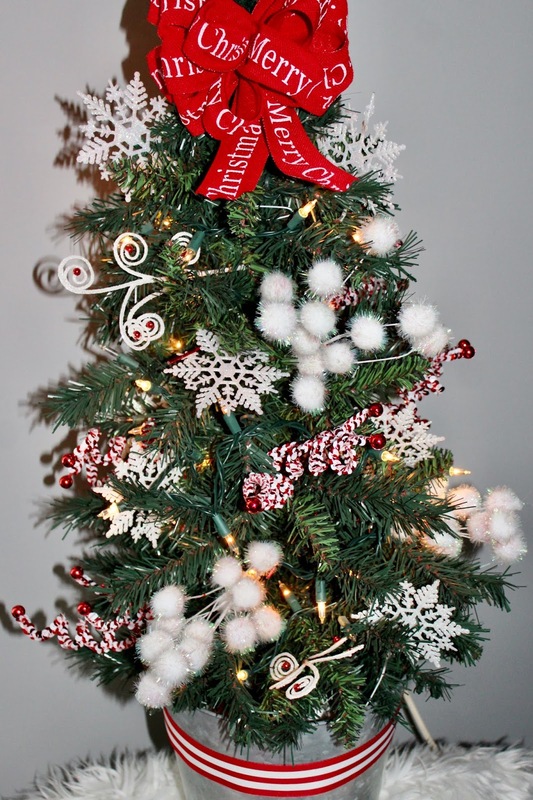 That mini flocked tree is just gorgeous and the perfect finishing touch! Ummmm I would pay cash money to stay in this bedroom, Andrea! Seriously! There's a little town here in WA called Leavenworth, and they're known for their Christmas markets - I bet they could use your design prowess! 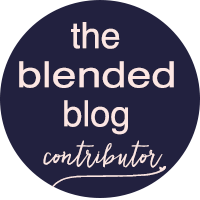 Thank you for sharing beaucoup ideas for this mama! You are the most creative and fun person around, Andrea!! This room is nothing less than spectacular!! 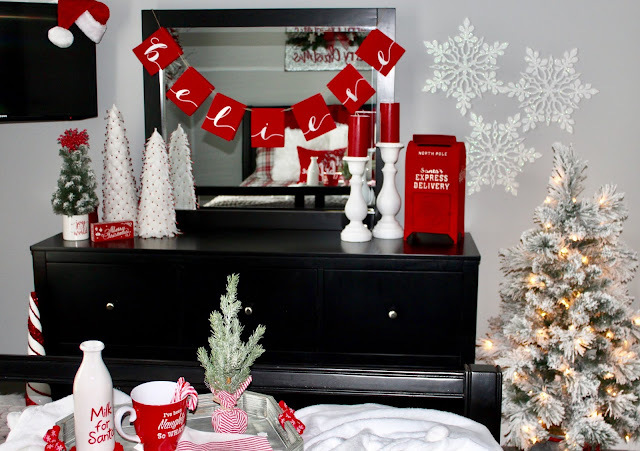 Oh Andrea, what a beautiful job you did decorating this festive and spectacular bedroom!! Every detail is just perfect, and I LOVE your furniture! I got that same believe banner! No only if I had found your cute wreaths for my cabinets. ;) I love how you totally transformed this room - wow! Looks so good. OK - I dont know what you do for a living, but if its not design or decorating, then something is wrong. That is totally your gift! What a cozy Christmas room! OH my word! Can I just live in this room from now until Christmas? :) It's so cozy and beautiful. I love everything about it!! Also, you are adorable. This is the coziest Christmas decorated room ever. You did a great job! Love this so much!! When can I come stay? The room is magical!! 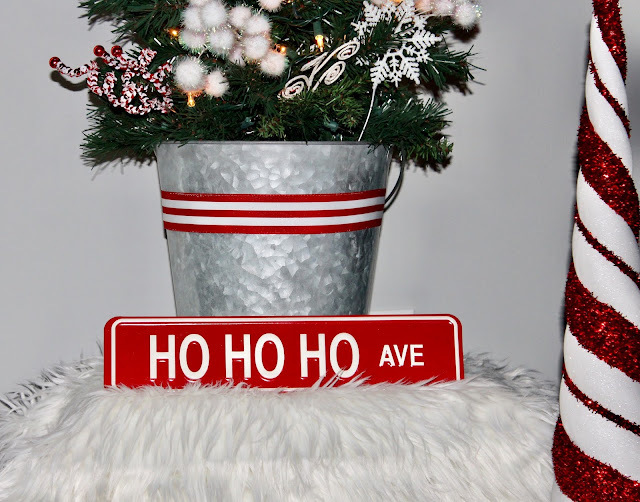 I've been adding a little holiday cheer to each of our bedrooms but how fun to deck out a whole room!! 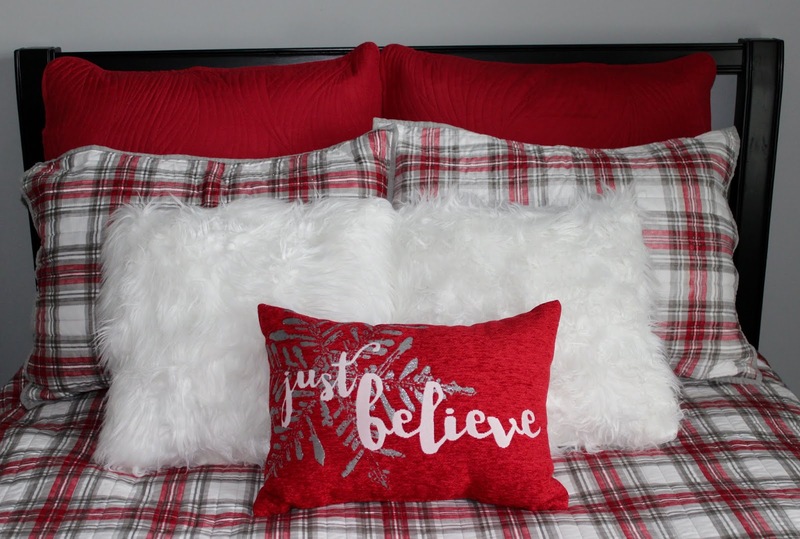 I'm obsessed with holiday pillows, throws and plaids! You look too cute in that last photo! 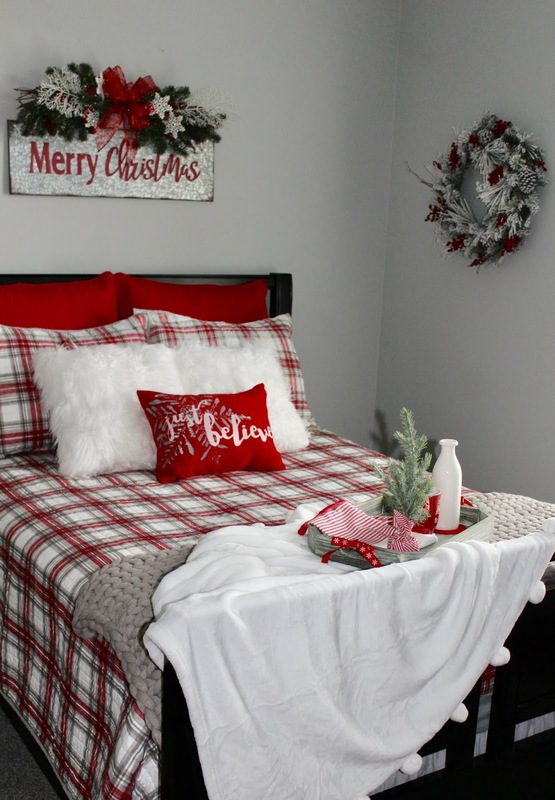 The plaid bedding looks so cozy and festive! Love how you decorated the bedroom! It's so cute, festive, and cozy! This is so festive and fun! 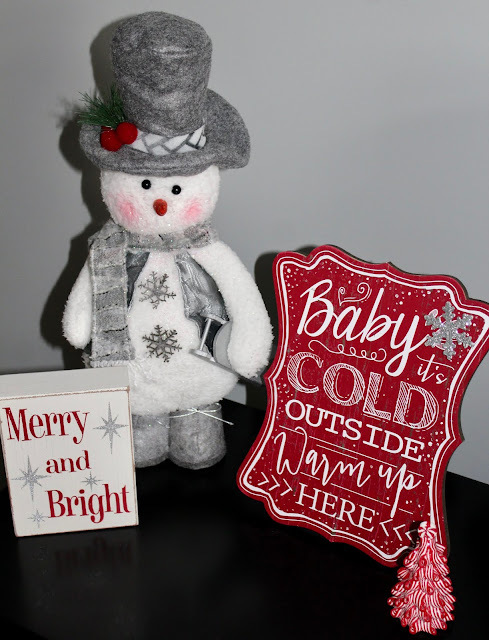 You always have the cutest touches when you decorate. And how cute are you in your PJ's?! So cozy! I love all the detail you put into this room! Each and every piece goes so well together! Your guests will be very happy in there! This looks straight out of a magazine, Andrea! You've done such a perfect job--any guest will be thrilled to stay there. I think my favorite thing is the tree in the bucket. Yes, I want to come and stay in that room. So, so cute!!! You must have tons of storage room to be able to have room for all this Cmas decor. :o)) I'm getting my Cmas on this week, quite simple but very pretty. Hugs to you sweet girl! I just love these neutrals mixed with pops of red, that is how I did my Christmas tablescape this year which I'll be sharing next week. 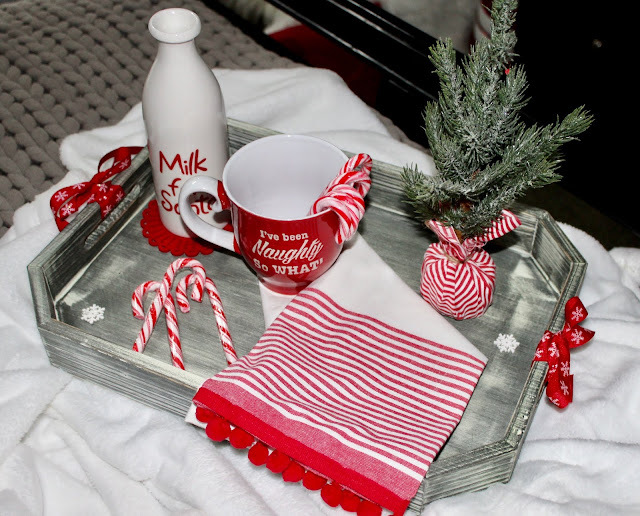 Ohh, I love that grey tray and how you decorated it! I need a tray like that to load up with a sweet drink & cookies once in awhile during the holidays! Ha! Very pretty! I'm looking forward to having a spare bedroom someday! Haha fantastic! I never have decorated bedroom! I really do just adore your enthusiasm for all the different holidays throughout the year, Andrea! And your eye for decorating is amazing. Your bedroom looks absolutely stunning. We haven't decorated our house for such a long time because we always go away on vacation for a month from mid December. I hope soon we just might stay at home (when we have the new house!) for once! Red and white sure do POP with that gray. I love everything you did in this room, and can't believe the quilt was from your grocery store! Have a wonderful week! What a beautiful and festive space! I love how it turned out! And that quilt is such a great find - I can't believe you found it at Meier! I love it! The quilt set looks so cozy! What a pretty room! I love it...so bright and festive for the holiday! I am obsessed with this room. Please come decorate mine and my girls' room!! That is so fun and Christmas-y. I have ALWAYS wanted to do a room up for Christmas - maybe next year I can try for my guest room. 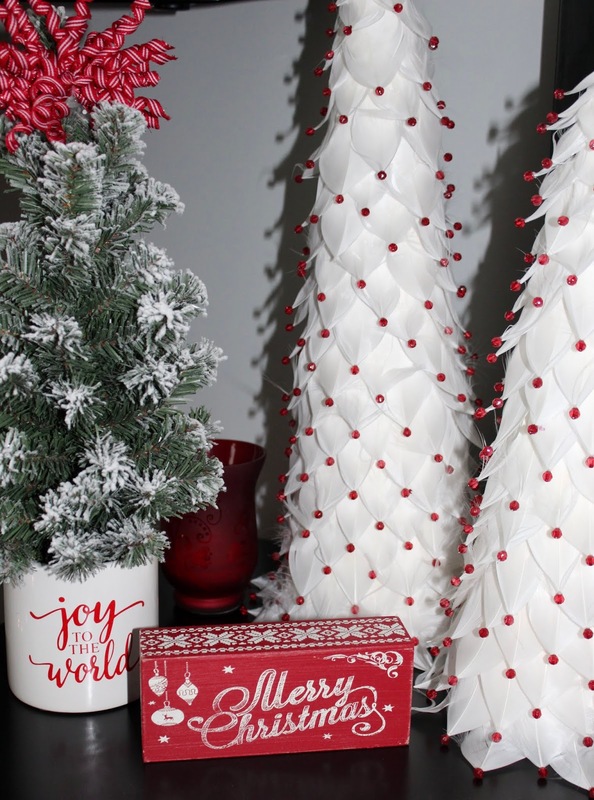 Love that flocked tree - and the Meijer steal - I can't believe that! What a fun room! Now I want a guest bedroom even more in my next house. 😉. Those pjs are precious. The guest room looks so beautiful decorated for Christmas. I love the way the red and white looks. Do very pretty and festive. A dreamy christmas bedroom and you look so darn cute in your jammies. This is simply gorgeous! I love every single detail and this would definitely put me in a cheery mood everyday. You need your own show on HGTV- you are amazing at decorating. Love it! Looks so pretty and festive. Looks so great! These are pretty! Thanks for sharing at the To Grandma's House We Go DIY, Crafts, Recipes and More Link Party. I pinned this! Hope to have you join again this week. Oh What Fun! 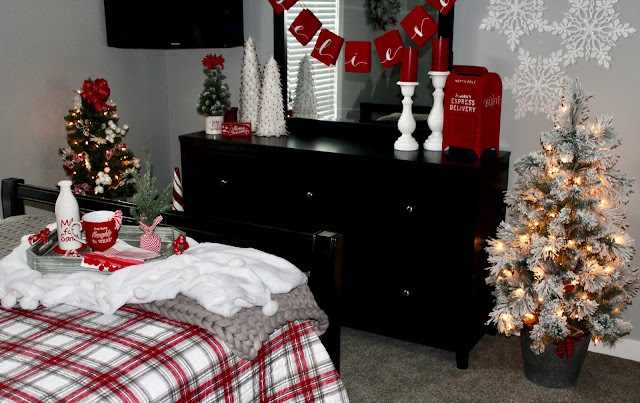 Your beautiful Christmas bedroom should be featured in a magazine. Send it in for next year's issues! This is one of my Feature picks for the Merry Monday party this week.